Welcome to Port Chester, NY! For anyone not familiar with this city, it's actually pronounced PORT chester, not port CHESter as you might think (same inflection as Westchester). Before we tour this store - I drove by this store (on the highway) earlier today, and it looked like it might be closed, and I thought the sign was missing from the street. I could be wrong, though. 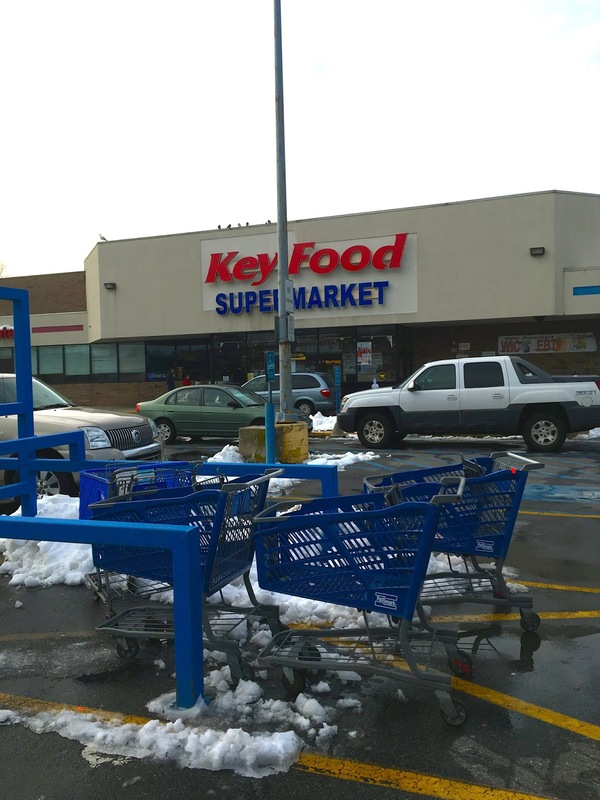 These Key Food stores seem to be dropping like flies - Superfresh Garwood is closed for renovations (supposedly), and I heard Key Food in Peekskill, NY is closing this week. It's an old A&P Sav-A-Center. Does anyone know if this store is still open? Now on to the Key Food of Port Chester. It was built in 1982 as a Pathmark. Thanks to the real estate company's outdated website, we can learn that it comes in at just under 60,000 square feet and is situated in a small strip mall on four acres. Apparently this store was run by an outfit called the St. Anthony Supermarket Corp., a Supermarkets General/Pathmark affiliate. I know other Pathmarks were run instead by Pathmark Stores Inc. or Supermarkets General Corp., so I don't know where St. Anthony comes in here. Many independent stores use the formula [ADDRESS] Meat & Produce Corp., for instance, 241 Walker Meat & Produce Corp. for a store at 241 Walker St.
Key Food - or more specifically, Anthony Peña, who also owns Key Food stores in Bridgeport and Norwalk, CT under the co-branding Key Food/CityMarket - has done no substantive renovations in this location. It's a practically original Path to Savings store with some slight modifications. They're still using the Pathmark carts too, and there were surprisingly few carts around (look at that lineup outside the Pathmark here!). This shot was a lucky coincidence with the seagulls to the right so clear. 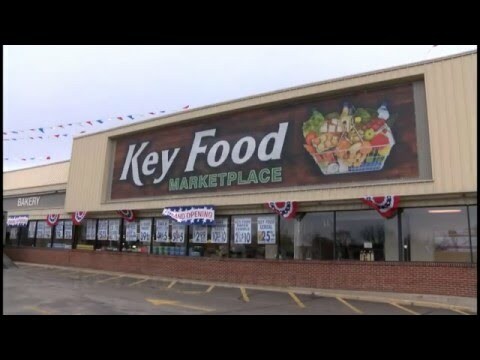 You can see easily here how little Key Food did. What you can't see here is a sign just to the right of this part of the facade that says Pharmacy Dept. This store has no pharmacy. Like many Pathmark Super Centers, the produce aisle is in the middle of the store. The area to the right would have been all HABA with pharmacy in the front; meat/seafood/deli along the back wall; and bakery in the far corner along the front wall. Key Food has no seafood or pharmacy. Easily this store's best feature is its produce department. It was large, well-stocked, well-priced, and fresh-looking. The baskets are a nice touch to warm up the impersonal Pathmark cases! The HABA area to the right of the entrance has become a badly-stocked junk area. The case in the front with the snow shovels, water, and Vita Malt is a Pathmark floral display. The old pharmacy would have been straight ahead. Notice the area to the far left, where the ceiling is lower and darker. This is a closed-off area that probably would have been more HABA. Key Food is obviously in way over their head in this location. The greeting cards are a good space filler, but the beer in the meat cases is pathetic. We're in the last aisle here looking towards the closed-off area. Notice the understocked shelves with nothing in particular on them. 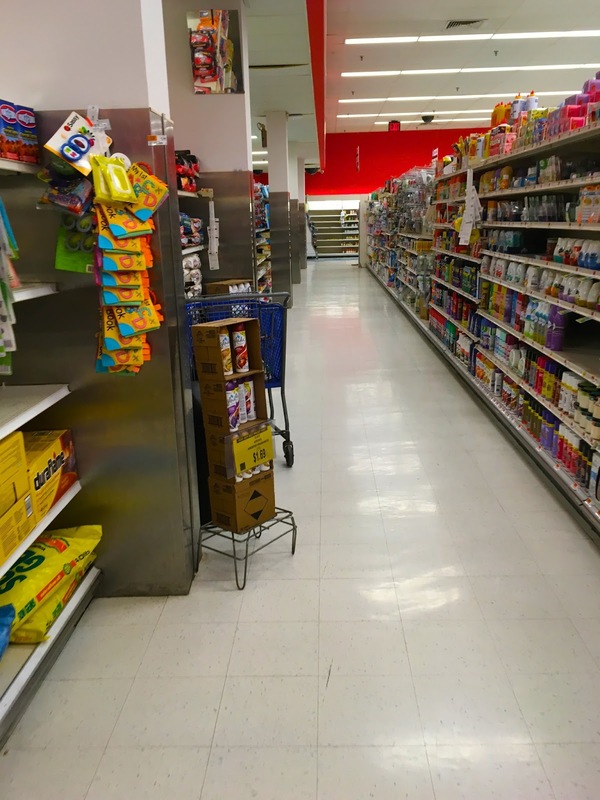 The last open aisle. I guess if nothing else, the store was very clean. 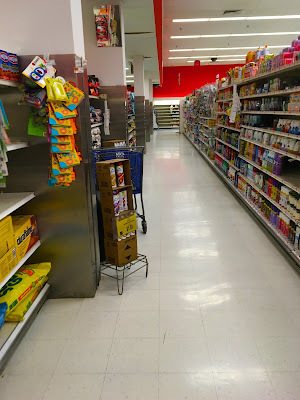 The empty pharmacy shelving can be seen straight ahead. There is no evidence that there are plans to reopen the pharmacy. Looking along the back wall of the store. There is a deli counter on the right, and junk shelving visible where the seafood would have been. There were a few guys working on a hole in the floor near where seafood was, attesting to the facility's bad condition - and also making it IMPOSSIBLE to get any pictures in that area. It didn't help that I could count the number of other customers in the store on my fingers, but there were probably as many or more employees. The international aisles, however, were great, as one would expect. But zoom in and you'll see the sparsely stocked deli case. Roughly half of the freezer cases were completely empty. A few additional cases were stocked with dozens of facings of the same product. That's not a good sign. The only hopeful explanation I can come up with is that they're replacing the cases - notice the different types of cases. In this photo, the black ones look much newer, but in person, they actually look about the same age. You can see, though, much of the case to the left with empty shelves. Dairy is fully stocked and in the last aisle. Here we're looking to the front of the store, towards the bakery. Notice this is the first customer we've seen in the entire tour. (There will be four more in the picture of the front-end, and one in the bakery picture.) That's about all there were in the store. The bakery was decent, but I couldn't tell if they bake in-store. Of course, though, the muffins have to be under the donut sign. Just past bakery is the one place Key Food actually changed Pathmark's layout. They are adding a hot food/café area. The tile backsplash is new, and while it's nice, it doesn't match the rest of the store at all. There are lots of hot food cases, and one closed case that might be used for more bakery goods. Then this large empty area is most likely where they'll put chairs and tables. You can see the hot food area in the distance above. Obviously this store's best features are its produce department and its international selection. Otherwise the store seems to be stuck in a transitional period which it likely will never escape from. It has great potential but to really bring it up to its potential would require a lot of time, effort, and $$$$ that these operators just don't have. It's really a shame. It doesn't help that there's a Compare Foods in downtown Port Chester and a Whole Foods within walking distance of this store, which cover the two ends of the spectrum. Oh yes, and one other strange thing about this store - it didn't have its own circular. I've seen stores with no circular before, but never one that used the circular for a different location - at the front entrance was a stack of circulars for the store at 717 West Ave in Norwalk, CT. Come on, get your act together! If this store were to close, I'd love to see a Food Bazaar move in here. They have the resources to realize this store's potential and it's the perfect neighborhood for them. It's heavily ethnic and generally lower-income, yet with higher-income residents surrounding it and the impending redevelopment of Port Chester, it could be an ideal location for them.